these jeans. Because, that makes sense. There's probably more good news than bad this week regarding the squad news that I've heard. Starting with the bad news, Aaron Ramsey faces a fitness test on the ankle injury he picked up last week. He's supposed to train today and has "a little chance" to feature. That phrasing leads me to believe that he's not very likely to start. I also haven't heard much about Tomas Rosicky's knee injury, the knock he picked up on international duty. Let's call him a doubt, too. The good news is that a trio of players return from their domestic suspensions. Alex Song, who had a great performance in Germany on Tuesday, returns to the holding role and Gervinho returns to the wing. Carl Jenkinson also returns from his one match ban to provide cover for Bacary Sagna at right back. We'll have a better idea about the time table for the returns of Thomas Vermaelen and Jack Wilshere in three or four weeks after the next international break, as that is when Vermaelen can return to training and when Wilshere can take his ankle boot off. While I did not get a chance to see the Dortmund game because of work, from everything I've heard, Kieran Gibbs looked suspect on the left (compared to a brilliant defensive performance by everyone else on the back line.) Perhaps this could mean a start for Santos? I really can't tell how he is going to be used yet. Injuries to Ramsey and Wilshere meant a start for Yossi Benayoun against Dortmund, but I'd rather see Emmanuel Frimpong play against a side like Blackburn for tactical reasons. There's also a question of who drops to the bench for Gervinho: I personally think Theo Walcott is in worse form but would actually expect Andrei Arshavin to be the one sitting, since Gervinho usually starts on the left flank. Predicted XI: Szczesny, Sagna, Mertesacker, Koscielny, Gibbs, Song, Frimpong, Arteta, Gervinho, Walcott, van Persie. David Dunn returned from injury to start for Blackburn last weekend, but was subbed off early in the second half and remains "touch and go" according to manager Steve Kean. Add this to two other injuries suffered by Rovers players against Fulham (Chris Samba was removed with a back strain and Junior Hoilett suffered a concussion after a nasty collision with Mark Schwarzer) and Blackburn has a lot of doubts on the injury front. Despite all of these doubts (which also includes a knee injury to Ryan Nelsen and a hamstring injury to Morten Gamst Pedersen), not one of the five players listed have yet to be fully declared out for Saturday's match. that this match must have been a figment of my imagination. I'm not going to lie; when I started writing Arsenal's league form at the top of this post, I accidentally wrote "D" instead of "W" at the very end, as it has seemed so long since Arsenal had a positive run of form. That, and Arsenal, of course, drew midweek in the Champions League. The thing about positive runs of form is that they take a while to get going. The media has been positing the question of whether or not Arsenal has finally turned the corner again. After two matches? A 1-0 win at home against Swansea and a 1-1 draw? Let's be clear, these results are huge for the squad. Three points in the league are three points in the league regardless of how you win them and the performance on Tuesday in Germany was something of which to be proud. But the only way Arsenal's post-Carling Cup Final disaster actually turns the corner is if they go on a significant run of form. No holding back against teams you "should beat;" that just sets you back to square one when you have a disappointing result. Arsenal in recent years have made a habit of dropping points in September against sides they should be beating: West Brom last year and Hull City three years ago, for example. That just flat out can't happen anymore. I think this line might be the most important thing to think about: An Arsenal win would give them consecutive victories in the league for the first time since February. As for Blackburn, they have to be playing for their Premier League lives right now as they are strong relegation favorites. Rovers sit dead last in the table. They are one of five teams that have yet to win a game this season and they are the only team with just one result, last week's 1-1 draw with Fulham is their only point. They lost to Wolves at home to open the season (in what I thought was, right of the bat, a relegation six-pointer) and also lost Aston Villa and Everton before their draw with Fulham. Their only win this year was a Carling Cup win over Sheffield Wednesday. This was from Arsenal's last loss at Ewood Park. net with defenders all just kinda standing there watching. Arsenal took four points from their two league meetings with Blackburn last year. This fixture took place in late August, with Arsenal winning 2-1 thanks to goals from Theo Walcott and Andrei Arshavin. It's the match where Robin van Persie twisted his ankle, then missed about three and a half months. It was also the last time Arsenal saw Thomas Vermaelen until April, as he was sidelined on international duty a week later. At the Emirates in April, Arsenal and Blackburn played to a frustrating 0-0 draw in the midst of the Gunners' post-Carling Cup Final tailspin. Arsenal have won six of their last eight meetings with Blackburn Rovers dating back to December of 2007. Among those non-wins were last year's 0-0 draw and Blackburn's 2-1 win at Ewood Park in early May of 2010, where Lukasz Fabianski and the Arsenal back four (of Sagna, Sol Campbell, Mikael Silvestre, and Armand Traore) were found horrendously wanting on set pieces. Arsenal have not won their league meeting at Ewood Park in consecutive seasons since winning 2-0 in March of 2004 and 1-0 in March of 2005. Not a historically easy fixture for Arsenal, by any stretch. The referee is West Midlands-based Andre Marriner, working only his second Premier League match of the season, which is now five weeks old. Last week was his first top flight game of the season, as he took charge of Manchester United's win at Bolton. The match week prior (before the international break), he worked in the Championship during Crystal Palace's 1-1 draw with Blackpool. 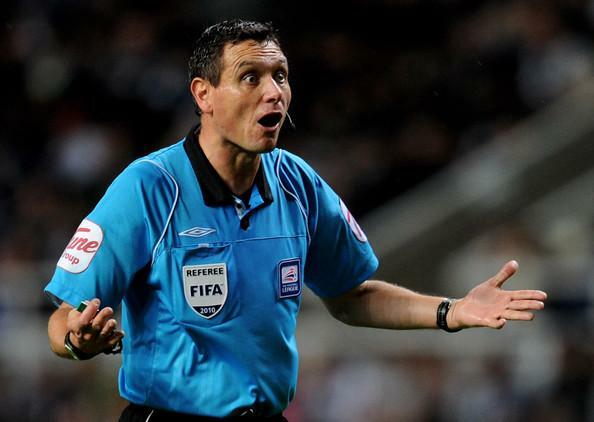 Many things baffle Andre Marriner. After Arsenal's match is the early start, there are five matches in Saturday's standard 10:00 a.m. Eastern time slot, no late game Saturday, and four matches slated for Sunday. On Saturday, Aston Villa hosts Newcastle at Villa Park, Bolton hosts Norwich at the Reebok, Everton welcomes Wigan Athletic to Merseyside, Swansea welcomes West Bromwich Albion to the Liberty Stadium in Wales, and Wolves hosts Queens Park Rangers at Molineux. The weekend's biggest matches are on Sunday, of course. To kick things off at 8:30 a.m. Eastern, Liverpool travels to North London to face Tottenham at White Hart Lane. Two matches get started at 10:00 a.m. as Fulham hosts Manchester City and Sunderland hosts Stoke. Then, in the late game at 11:00 a.m., the weekend's marquee match-up as Manchester United welcomes Chelsea to Old Trafford. Phil Dowd takes charge of that one, so expect a good amount of controversy.